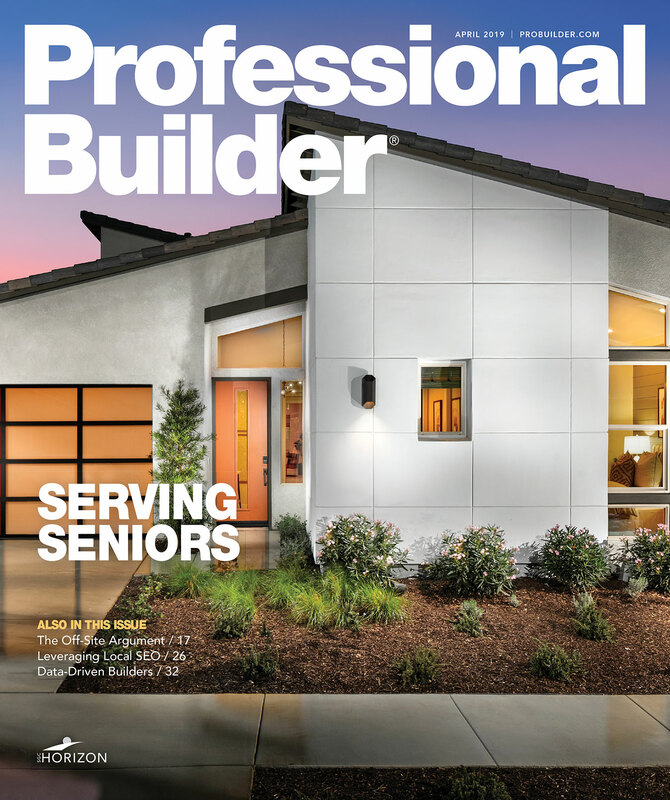 Like many homes today, and particularly those in Florida, The New American Home 2018 caters heavily to outdoor living, with a seamless interplay from indoors to out and distinctive living spaces throughout the rear of the house. But getting there wasn’t quite as easy as in other projects. Anyone familiar with Florida housing will immediately notice the distinctive differences in the lakefront property upon which The New American Home sits. For one, it’s large—about an acre and a half. And it’s rolling, with a slope of about 30 feet from front to back. The result was ample opportunity for views of the water but also a challenging design. The design team’s overall approach to creating lots of outdoor living space in spite of the steep backyard was a series of terraces, a solution that addressed the slope while creating distinct levels for each lifestyle area. On the back of the house, the interior great room flows effortlessly from inside to outside. 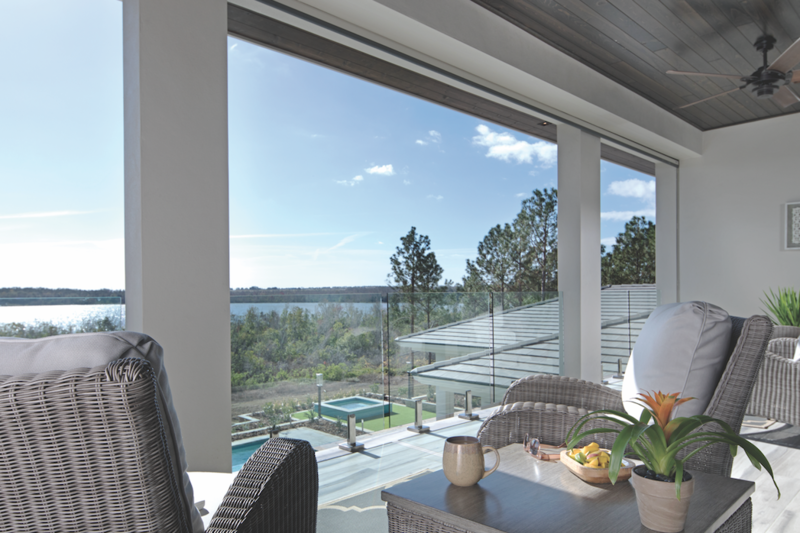 Glass walls from Panda Windows & Doors slide fully open on a thin track. The team installed the same Emser tile, a large-format wood-plank-style porcelain, on the inside and outside, creating a seamless visual plane. On the patio, the planks flow into soft-gray pavers. 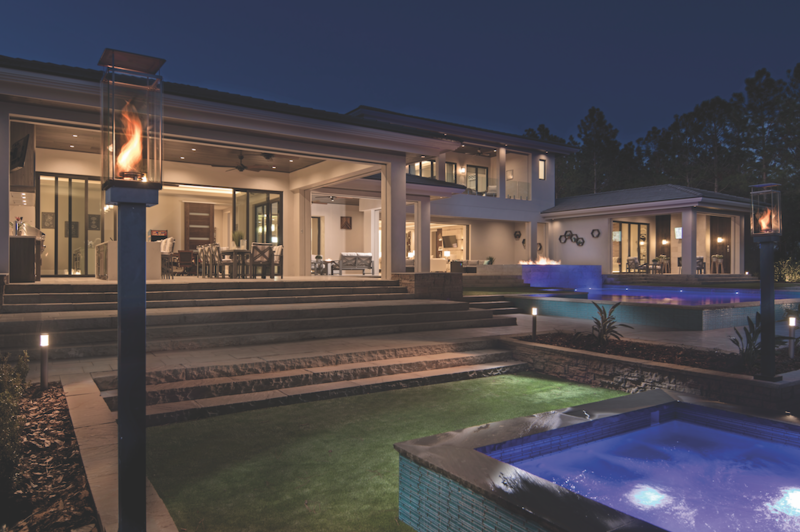 “The goal was to be able to open up the inside and outside of the home and create spaces that are enjoyable,” says John Kolb, EVP of Legacy Custom Built Homes. Covered porches and balconies connect other rooms along the rear of the home, and the master bedroom and the game room also flow outward toward the communal space. From the great room, against the wide backdrop of the lake, the expansive outdoor space reveals itself first in a monolithic fire-and-water feature that flows into the pool in the level below. 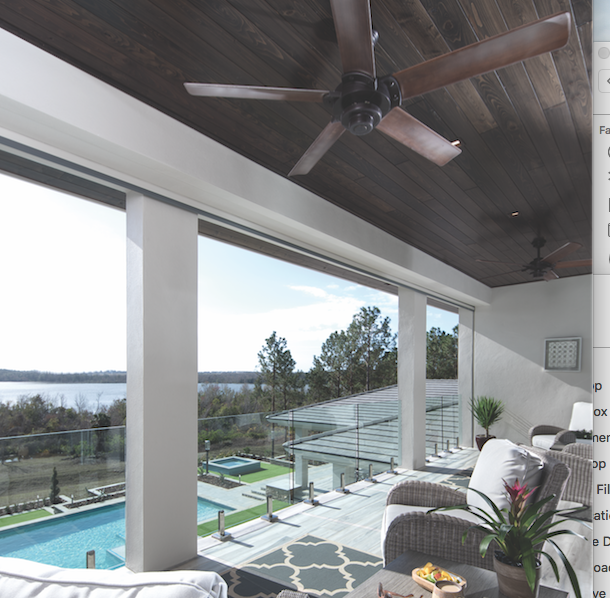 Designer Kate Clarke, president of Homes Reimagined, selected the feature’s white Carrara marble to blend with the interior; a turquoise waterline picks up the colors of the lake. The summer kitchen sits in a covered porch off to one side. Clarke kept usability as much as aesthetics in mind. She selected NatureKast cabinets in a wood style trimmed in stainless steel, combining an interior-like look with a robustness to withstand the outdoors; the stainless steel appliances from DCS by Fisher & Paykel complement the cabinetry. The appliance package includes two flat grills with a close-down hood and two side burners to create two full cooking stations. A chiller wine station provides space to keep beer and wine on ice, with extra storage provided by a traditional outdoor beer/wine cooler and a refrigerator. 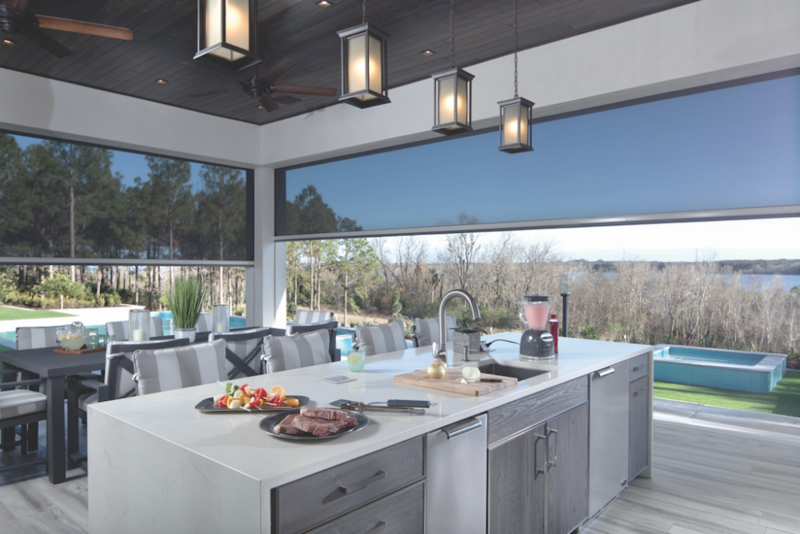 Above, retractable screening from Phantom Screens shields the outdoor kitchen from bugs, and Progress Lighting pendants illuminate the space. An island with Kohler fixtures, DCS appliances, an InSinkErator drain, and Corian Quartz countertops offers room for many cooks. 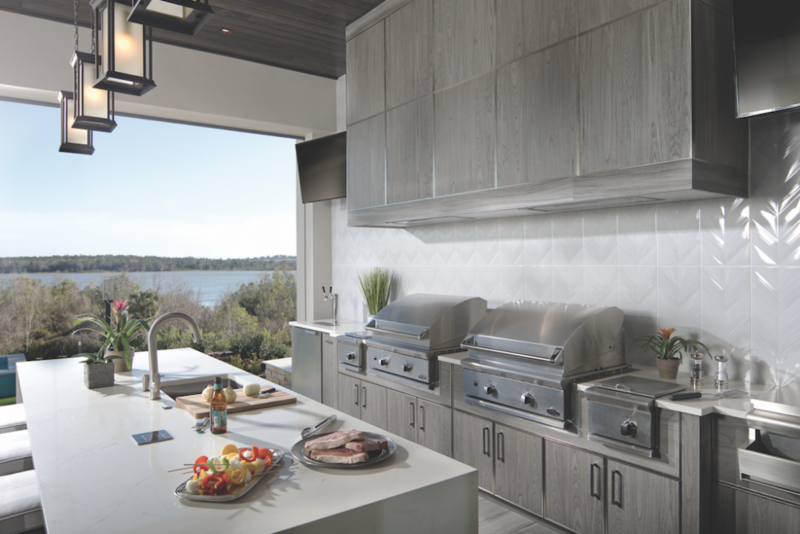 Side-by-side DCS grills and a generously sized island make big-party cooking a cinch. Popular design trends emerge in the kitchen island’s DuPont Corian Quartz countertop with a waterfall edge, as well as a backsplash of vertical large-format Emser tile with a chevron design. 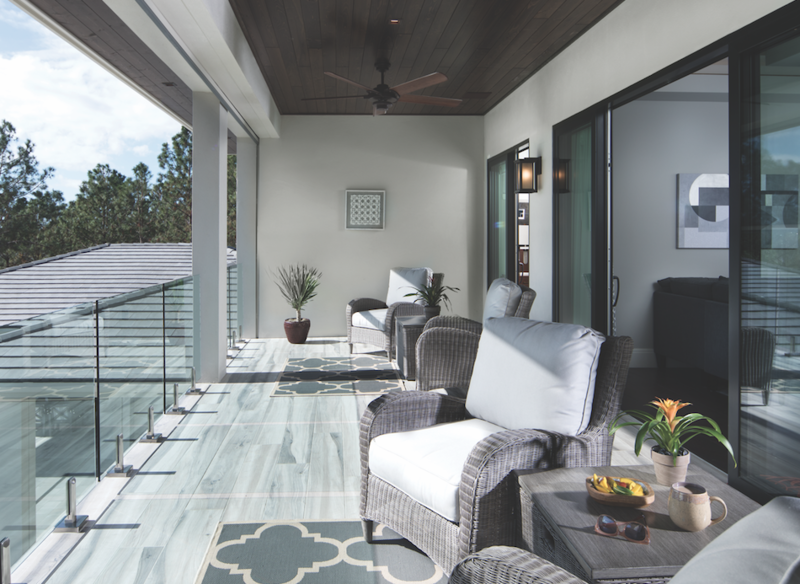 A wall of vertical tile connects the space visually to the adjoining game room, while Phantom Screens screening systems in the outdoor kitchen and on other porches roll down to keep out bugs. A garage door by Clopay adds contemporary warmth, while Tempest Torches light up the night, and pavers by Natural Paving USA are used at the home’s front and its rear. A second-floor balcony features Panda sliders. Concluding at the bottom, the terracing opens up to grass and natural vegetation as it nears the water’s edge. “It’s been a huge challenge but a huge reward,” says Kolb. At the front of The New American Home, the rolling terrain necessitated a reduction in grade to make more of the area level. Redmon designed the front to blend the natural areas into the cultivated landscape. Pine trees on either side of the lot create visual interest. In the front yard, the pavers’ geometric shapes reflect the style of the house, while edges of the garden beds flow into the natural area. Four palm trees flank the turnaround, and magnolias frame the front yard as you near the house. 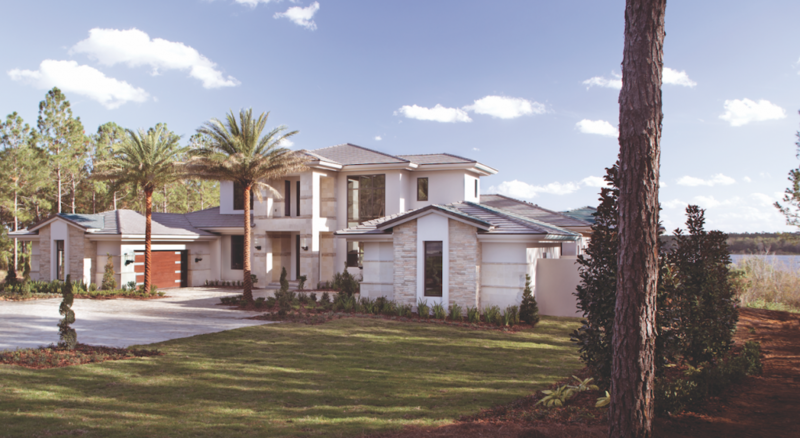 The exterior façade had to reflect the Tuscan style of the community in which the home sits, but the team took some liberties. “The form of the house is traditional, but applying modern themes speaks to the current design trend,” says Hyatt. The home is roofed with concrete tiles by Boral Roofing and clad with products by Ply Gem/Canyon Stone and James Hardie. Doors are by Simpson Door Co. The design team opted for square openings rather than the arched style typical of the Tuscan genre. The number of windows also is much greater, including a two-story-high expanse of storefront-style Panda windows revealing the floating stairs within. Rather than choosing the typical Mediterranean clay S-tile, they installed Boral Roofing’s flat roof tile; the Boral roofing system includes underlayment and battens that use a clip system to ensure moisture can drain away. To create the façade, the team combined a flatter stone from Ply Gem/Canyon Stone with a textured stone. “There’s a lot of linear movement on the house,” Kolb says. Clarke redesigned the placement of the stone so that the flat stone and chiseled stone alternate. 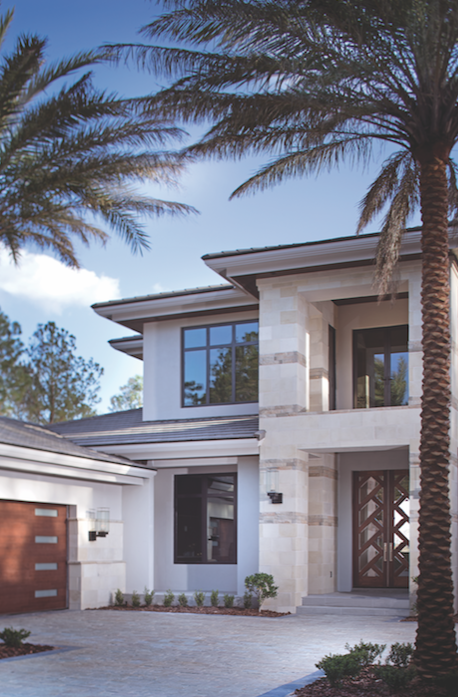 On the pair of two-car garages, which face each other across the driveway, she mixed stucco, ledgestone, and monument stone to create visual interest. Cobblestone pavers keep to the Tuscan theme but in a muted color Clarke says lends a softer, more inviting look. 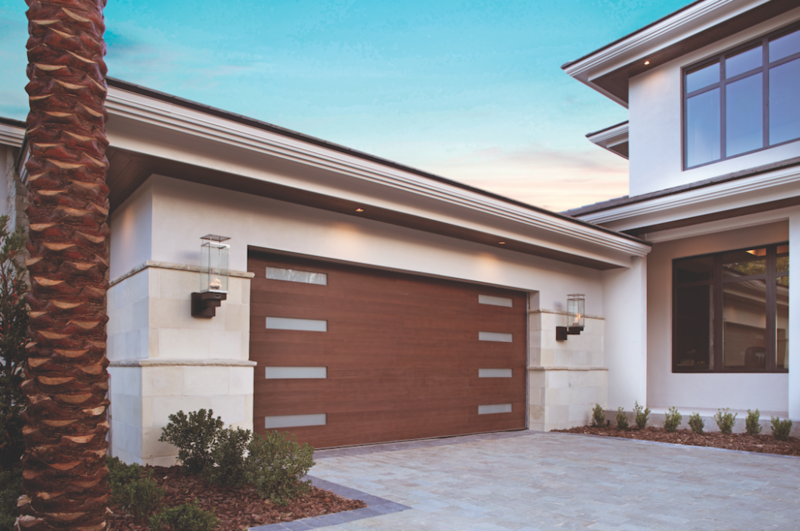 Walnut wood tones inside and out, including on soffits, doors, and garage doors, bring warmth, and Tempest Torches from Travis Industries add charm. Top-of-the-line Sherwin-Williams paint was used on the home’s exterior and interior. Finally, the team aimed for efficiency and performance in the design of the building envelope. The robust system includes Core-Fill injected foam insulation, Kingspan foam board, and Fi-Foil’s M-Shield reflective insulation. In addition, they used AeroBarrier, an envelope sealing system in which the home is sealed off, pressurized, and sprayed with “a fog of sealant particles,” according to the manufacturer, a process that fills gaps and leakage areas from as small as a hair up to ½ inch. Katy Tomasulo writes about design from her home on Bainbridge Island, Wash.